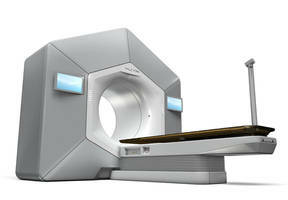 The new Halcyon radiotherapy system from Varian features the ProBeam® 360°. It is a new single-room proton therapy system. The new product will be introduced in Wuhan, China January 12-13 at the China Users Meeting. WUHAN, China, Jan. 14, 2019 /PRNewswire/ -- With nearly 1,300 Chinese radiation oncology professionals in attendance and an additional 8,000 users watching via a live webcast, Varian (NYSE: VAR) recently held its 2019 China Users Meeting in Wuhan, China January 12-13. The largest event in the company's history, attendees heard from Varian executives and customers regarding the company's vision of a world without fear of cancer, as well as cancer care solutions including radiotherapy, radiosurgery, proton therapy, software and integrated services. At the User Meeting, Varian introduced to the China market the Halcyon™ treatment system, which received China National Medical Product Administration (NMPA) approval in November 2018. Reaffirming its commitment to the China market, Chris Toth, president of Varian Oncology Systems, outlined the company's innovation strategy, positive clinical impact and Varian's transformation to a multimodal cancer company. "We aim to increase the number of patients worldwide touched with our technology from three million today to six million by 2022," stated Toth. "We are very excited about the launch of the Halcyon treatment system in China, and it's an important step to achieving our goal and expanding access to advanced cancer care." Kolleen Kennedy, chief growth officer and president of Varian's Proton Solutions, introduced the new single-room proton therapy system, ProBeam® 360°, and advances in Flash therapy. The Maryland Proton Treatment Center and Cincinnati Children's/UC Health Proton Therapy Center also shared their proton therapy experiences with the audience. Corey Zankowski, senior vice president of Varian Oncology Software Solutions shared Varian's roadmap of AI-driven automated treatment planning. The adoption of AI has the potential to improve clinical efficiency and quality, especially for the busiest cancer centers in China. Varian is a leader in developing and delivering cancer care solutions and is focused on creating a world without fear of cancer. Headquartered in Palo Alto, California, Varian employs approximately 7,000 people around the world. For more information, visit www.varian.com and follow @VarianMedSys on Twitter. 1. Varian's adaptive solution is a works in progress and not available for sale. 2. Flash therapy is currently in the research phase and not available for sale. Standing Frame aids youth wheelchair users.